French supplier Faurecia SA produces the complete seats and frames for the front and rear of the new Audi A1. The A1 comes in two trim levels: Attraction and the more sporty Ambition. To augment the dynamic appearance of the Ambition trim line, Faurecia provides two-color sports seats with lumbar support. The seats are equipped with seat belt tensioners, force limiters, head restraints and a standard fit height adjuster on the driver's seat. Although Faurecia is majority-owned by PSA, Volkswagen Group, which includes the Audi brand, is the French company's top customer. VW Group accounts for 23.5 percent of Faurecia's product sales followed by PSA (19.2 percent). Several suppliers improve vehicle safety including Autoliv Inc., which supplies the standard-fit driver airbag as well as the passenger airbag. In addition, TRW Automotive Inc. contributes the standard fit curtain airbag module and side airbag module. Robert Bosch GmbH regulates airbag deployment by providing control units. Europe's largest supplier also makes the A1's electronic stability control system. Other important suppliers include: Delphi Corp., supplier of the entertainment/navigation system; Webasto AG, which supplies the panorama roof; and ZF Friedrichshafen AG, which contributes chassis and clutch components. With the A1, Audi intends to challenge BMW's Mini brand, which has been able to charge a premium for its lineup of small cars because of their high quality and performance. Audi consequently placed demands on suppliers to produce premium-quality parts with close attention to detail. For example, Preh GmbH, supplier of the climate control system, was required to make control buttons that produce the typical Audi metallic "click" sound. The German supplier achieved that by using a plastic stop spring. Similarly, Preh used ball bearings to give the rotary knobs a precise and distinctive feel. 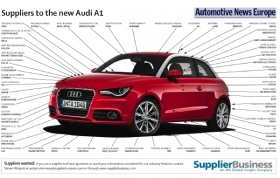 The A1 is equipped with a choice of two diesel (TDI) or two gasoline (TFSI) four-cylinder engines. The powerplants generate 86 hp to 122 hp. The A1 has numerous transmission options, including a seven-speed S tronic variant that offers rapid and smooth gear changes. In addition, buyers may choose between an automatic or manual transmission as well has a steering wheel gearshift. The A1 is built on the PQ25 (A05) platform, which also is used to make the Polo from sister brand Volkswagen. The A1 is made at a former VW plant in Brussels, Belgium. The carmaker invested approximately 300 million euros to renovate the factory, where it aims to produce about 100,000 A1s every year. However, demand exceeded expectations prompting Audi to increase production by 20 percent. In August 2010 the A1 went on sale in Europe. Prices in Germany start at 15,800 euros (about $20,220).